Post-reform redesign of clinical care delivery and supporting reimbursement models reflects the healthcare case manager's dual roles as care coordinator and utilization manager. Case manager work locations, job focus and caseloads are evolving in response to these shifts in the healthcare landscape. This infographic from the Healthcare Intelligence Network outlines case management keys to success, responsibilities, targeted conditions, challenges and average caseloads. More information on this topic can be found in: Case Management in 2013: Achieving Results with Cardiovascular Disease; Long-Term Care Next Frontier for Embedded Case Managers. 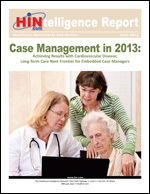 This HINtelligence Report provides data highlights on case management program components, results, and ROI; as well as improvements and innovations from embedded case management.